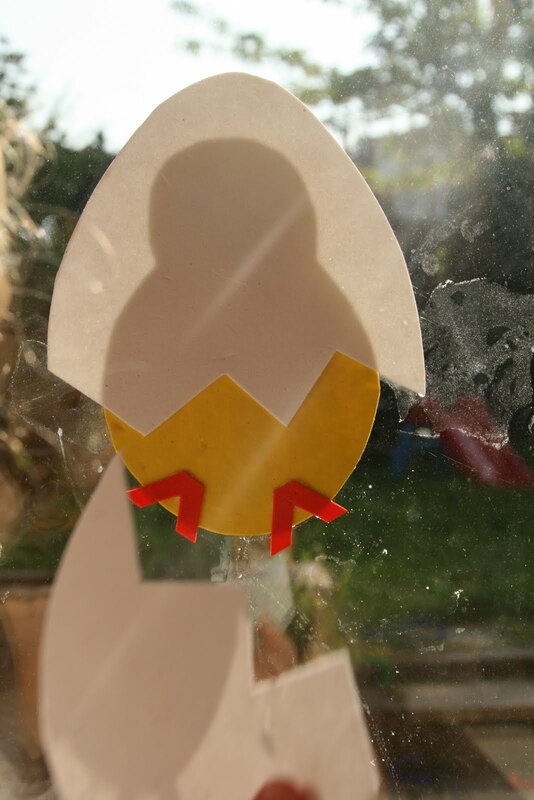 Make an open-ended creative play activity on the window or in the bath tub, using foam sheets cut into Spring shapes! Do you remember way back when we made some foam shapes for making art on the windows? 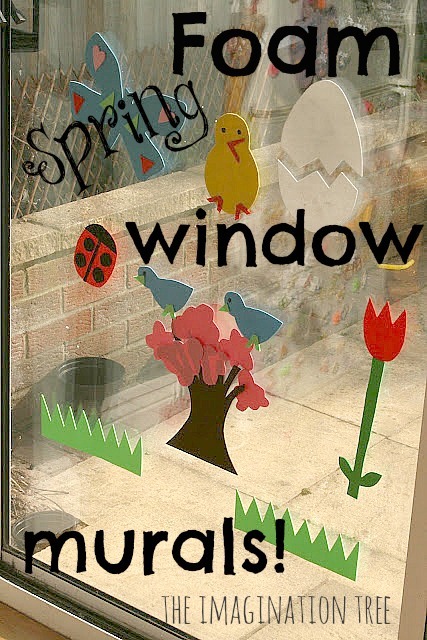 Those were SO much fun and promoted lots of open-ended creativity on our windows, fridge, washing machine and bathtub! Did I mention it’s clean and reusable too? Definitely time for us to make more, this time with a Spring theme! This project is SO easy and SO cheap to make. All you need is a packet of craft foam (£1 in a pound shop or Tescos) a pair of scissors and some water! I cut out two flower pots, lots of petal and leaf shapes in different colours, roughly the same size and some long green stems to arrange them onto. Every time she makes them, they will be different! Cakie was able to easily stick the pieces to the window by dipping them in a plate of water first. She also enjoyed painting some bits with a paintbrush. 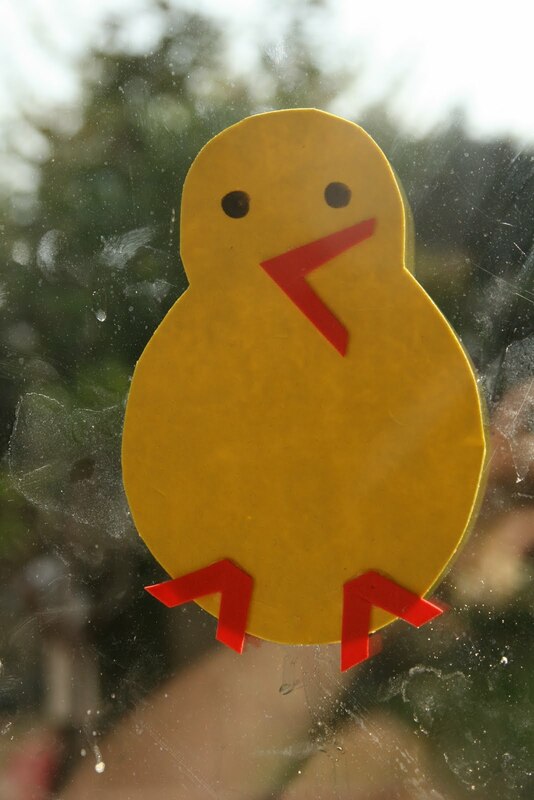 And how could I resist making this little chick?! I drew eyes with a permanent marker and stuck on his beak and feet using UHU glue. He even has his own shell that he can crack out of. The great thing about foam when wet is that it will stick on top of itself to make layers. Plenty of new opportunities for more fun! And we added a couple more birds too and Cakie wanted to give them all equal opportunities to hatch. Great chance to teach some nature facts and add to that knowledge and understanding of the world! Hello little butterfly! Again, I glued on the details, but for an extension activity you could give your child small shapes and invite them to make their own designs. This picture illustrates beautifully how dirty our windows are. It may be due to the water used in this activity, or it may be due to my lack of cleaning them regularly. I’m not sure! There are SO many other things you could cut out! Your imagination is your only limitation. I love how this activity can remain as a semi-permanent set up, can be used countless times and can be transported around the house (or travelling) to use on a variety of surfaces! Bath time Spring art anyone? Love this idea and the fact that it works for young and older toddlers – perfect for my cherubs. So simple, fun and like you say the possibilities are endless. Off to check my craft cupboard and see if I have a stash of craft foam. Thank you for sharing this brilliant idea. I think my older kids would love this in tangram form. What an awesome idea! Thanks for sharing. I am doing this soon. What beautiful shapes! You certainly wield a pair of scissors well 🙂 Particularly like the chick and egg. Cute! Art for Little Hands- the previous time we did this I just cut simple shapes for creating pictures with. That could be easily adapted for tangrams (and setting the challenge of what to create with a limited range of shapes!) So much fun for extension activities. Show us what you create! So colourful, pretty and cheerful. And the fact that kids can do it easily makes it so much more meaningful. Oh m these really are wonderful selection – I love the flowers, but also the chick and egg! Brilliant!! And fab that she did some cutting too! Thank you for your faithful linking up to Kids Get Crafty!!! Very neat project. It would be fun to do in the bath as well. This is a great idea! I hadn’t thought of using foam in this way. I will have to create something for JDaniel. Just back from our local big Tesco’s and they didn’t have craft foam! So disappointed. But a quick bit of digging yielded a pack (albeit more expensive than yours) on yellow moon. So I thought I’d come back here and share the link just in case anyone else’d had trouble sourcing some. I can’t wait until tomorrow morning to try this with M. Many thanks for sharing!!!! I didn’t know that foam sheets would stick with just water?! How long do they stay up? Another great idea about to be copied by me and two little girls…! (and the bigger ones when they come home from school too). Thanks! Absolutely brilliant! I have a stack of ‘unloved’ foam in my craft box, now I know what to do with it!